Several years ago, there was a small automotive shop by my house in Phoenix called Exklusiv Motorsports that specialized in modifying Volkswagens. They had a pair of these big red trucks outside, so one day I took a picture of them. It wasn’t until recently that I learned how rare these things are! These double-cab Volkswagens were sold in Northern Europe as very basic work trucks, but the TriStars were top-of-the-line models with full interiors, cruise control, power windows, heated seats, and armrests. Even rarer still, both of these trucks are the Synchro models (4WD)! As it turns out, the Volkswagen TriStar was never sold in the United States. Approximately 19 of them were imported into Canada for a special buyer, an oil exploration company who went bankrupt before the trucks arrived. The trucks were sold through Canadian Volkswagen dealers and some of them have made their way into the states during the last two decades. I actually found a build thread from the original owner which tells the story of how he bought these two trucks sight unseen in 2006. He sold one and began restoration on the other (the one with the extra set of lights on the front). Check out his Project Tristar thread for more details and pictures. Volkswagen only made about 1500 TriStar trucks worldwide. To have spotted two of them here in Arizona was a very rare sight indeed! 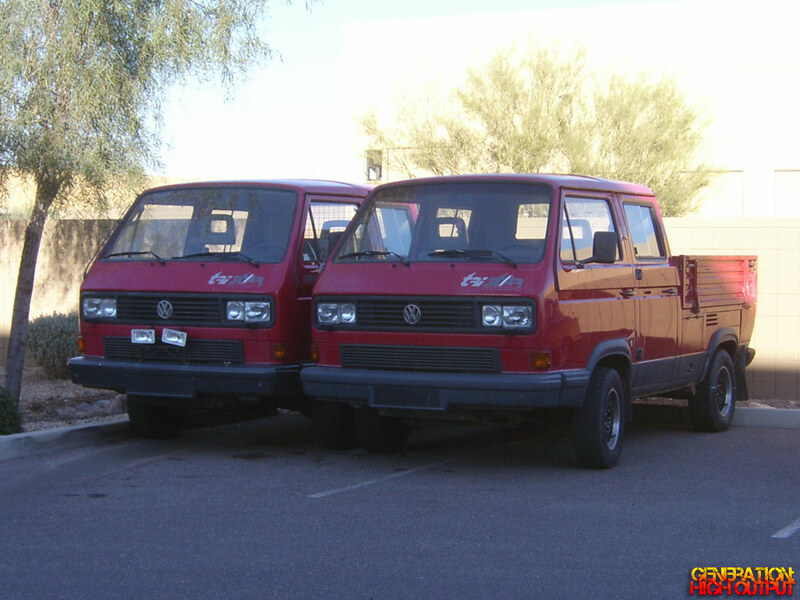 This entry was posted in Curiosities, Not Sold Here and tagged 4x4, das auto, DOKA, double cab, exklusiv motorsports, rare, syncro, tristar, Volkswagen by Trevor Freeman. Bookmark the permalink.